When The Amulet of Samarkand was first published there was a huge marketing splash which made me reluctant to read the book (perverse!). Plus I’d heard it contained a genie and magic, and that made me yawn. Then a personal recommendation encouraged me to put my prejudice aside and give Jonathan Stroud’s book a go. Back then my children were at primary school. I read to them every night and this took thirty to sixty minutes, so the book had to be enjoyable (for all our sanities). And phew, there was lots of laughter and pleading for a few more pages. Yes, we all adored The Amulet of Samarkand. I’ll admit that in retrospect I wonder how much my positive perception of this book was coloured by my children’s enthusiasm. I think adults are influenced by their children, and we often join them in their pleasures. So, without the influence of children, would I still enjoy The Amulet of Samarkand? I suspect I would. Therefore I recommend this book to all ages, including older primary, teen, and adults who aren't embarrassed to be seen reading children's books. The story is set in a parallel contemporary London, where magic rules and is corrupt. Magicians gain their power from enslaved djinnis (what the more common of us might call genies). The protagonist, Nathanial, is a young magician’s apprentice. That may sound familiar, but this boy is a refreshingly flawed young man who still has plenty of character defects by the end of the book. The magic is corrupt and so are the characters. 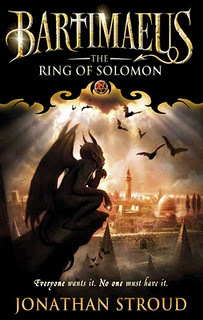 In the adventure, the humiliated and vengeful Nathanial commands the djinni, Bartimaeus, to steal the powerful Amulet of Samarkand from another magician. 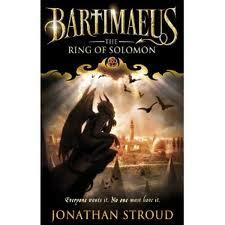 The tale is filled with wicked humour and suspense, and although the general plot might be considered rather well worn, the glorious characterisation of Bartimaeus overshadows any doubts. Footnote 5: They were all at it – beetling off in coach parties (or, since many of them were well-heeled, hiring jets) to tour the great magical cities of the past. All cooing and ahhing at the famous sights – the temples, the birthplaces of notable magicians, the places where they came to horrible ends. And all ready to whip bits of statuary or ransack the black-market bazaars in the hope of getting knock-me-down sorcerous bargains. It’s not the cultural vandalism I object to. It’s just so hopelessly vulgar. Footnote 6: I’m no great looker myself, but Faquarl had too many tentacles for my liking. 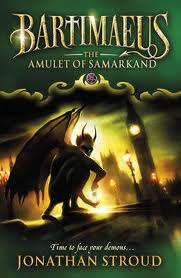 The Amulet of Samarkand was originally published in 2003, and was the first in the Bartimaeus trilogy. These three books have recently been reissued and in October 2010 a fourth book was published (so now it’s classified as a Bartimaeus 'sequence').